Forum Index > Off-topic Talk > Do you carry a knife? Posted: Sun 05 Apr, 2015 9:36 am Post subject: Do you carry a knife? Nowadays it´s not common to carry a sword anymore, but knives are still as usefull as they´ve been for the last 200.000 years. These are my favorite folding knives right now (Zero Tolerance ZT 0562CF, custom folder by German bladesmith Andy Haas, Umnumzaan Tanto by Chris Reeve from Idaho). Everyday, it's crucial for my work. I usually have a folder worth less than 50 dollars since they can be broken or lost. 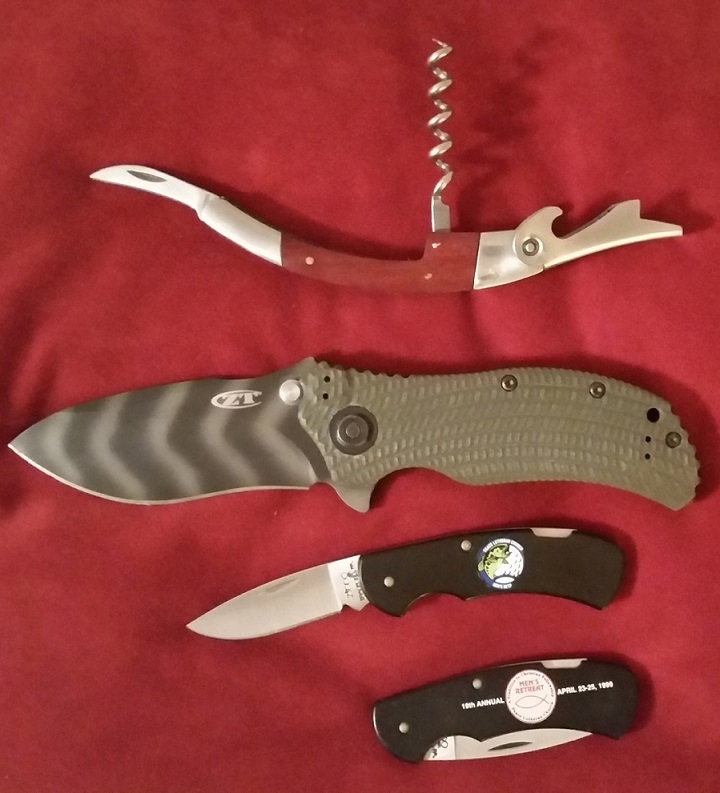 A small Gerber, Buck, Benchmade, or Moore. All have good steel. The design and utility is worth more to me than a particular brand. I don't worry too much about self-defense from the cows, sheep or horses. But I have to have one EDC. I carry a knife only during certain sporting activities, for safety. Otherwise, no knife. Mostly as an emergency disentanglement tool. Activities include rock climbing, whitewater kayaking, scuba diving and caving and cave diving. My standard sports knife is shown, about 6 inches long. I used to carry this all the time before there were such things as Leatherman tools and the other copycats. This is what I carry now. My most carried knife these days is an SAK Soldier with Alox scales. I typically have other stuff desk side and more little stuff bedside. When I had been working in warehouses, usually a large folder like a Kershaw Whirlwind or Al Mar Eagle and a smaller lock blade, usually my Benchmade money clip Big Spender with a Ti frame/no scales. Various small fixed blades and folders used to get a lot of daily use. Many more not shown here and some have moved on. Yes I do! A Victorinox Farmer. It's not "tactical" but it sure comes in handy. When it's not a cultural hassle I also like a machete with 18" blade, the two make a really great team! Historical fencing on Florida's Treasure Coast! The Zero Tolerance is my daily carry; the two small Zippos were give aways on this fishing retreat I used to go on with my dad and they work nicely with more formal attire (suits, business slacks - the kind of thing where a larger clip-knife would be out of place); and the wine key technically HAS a knife blade, and comes in very handy for picnics, gatherings with friends, and for use with the Wine Garden Committee of the Houston Livestock Show & Rodeo, to which I belong. There's also and old boot-knife in the door of the Jeep, and various hunting knives and a great old Buck lock-back that have been carried over the years. Absolutely. I keep a Buck Whittaker Metro on my keychain always. It's a tiny pendant looking folder with a liner lock and a built in bottle opener. Very handy, very PC. I've been keeping a Cold Steel Spartan in my pocket most of the time too. It's a huge heavy overkill of an EDC, and I REALLY like it. I bought as a beater for shop work, and it's even big for that, it's over a half pound in weight, has a 4 1/2" blade and a 6" grip making it 10 1/2" when open. When closed it fills a whole pocket by itself. I like it because is as close to a "folding fixed blade" as you can find. The lock self adjusts for wear, and you actually need to store it half opened for 24 hours so the spring breaks in. It gets bad reviews because it can be so hard to close fresh out of the box. Makes me smile every time I open it, and the lock engaging snaps loud enough to turn heads. Cold Steel makes a lousy sword, but their folders are tanks. If I'm carrying a bag I'll toss in my Leatherman Wave. A gift from my dad, it has my initials engraved in it, saw me through Europe, Alaska, and the Northern California Redwoods. I've used it to fix cars, bikes, and skateboards, I've installed light fixtures, and mended fences, and sharpened axes with that thing. I used to call it my eleventh finger. I would carry it more, but it's heavier than the Spartan, and I don't like carrying it in the belt sheath anymore. I own a lot more but these see the most use and spend the most time on my person. I typically carry my folding knife with me, I only leave it at home when going to airports, museums or cities. I bought it because it was quite cheap and I liked the looks of it. Since I have it, I don't carry any other pocket knife any more. I also carry a very small folding knife on my climbing rescue biner, but I happily never had to use it on anything other than sports tape. Knives are a no-go at work (public school). 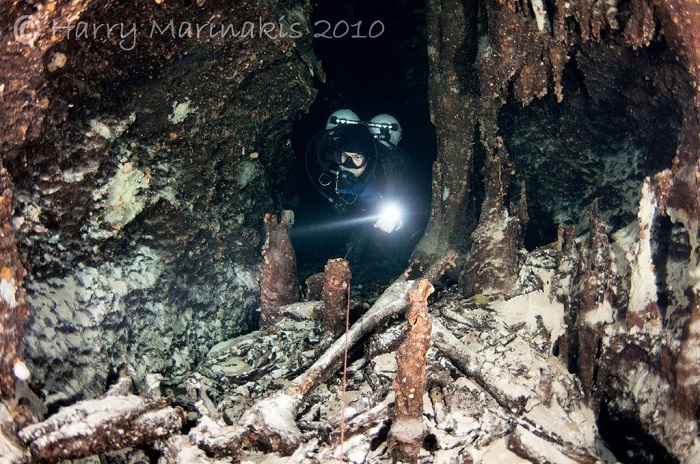 I’ve been a certified and practicing scuba diver since 1987 and never once did I want to enter a cave. That’s a whole other level of awesome/crazy. I normally have a Kershaw/Boker Gnome/Opinel in my pocket. A Svord Peasant lives in my car. Occasionally, instead of a pocket knife, I have a Ahti puuko or my Pikula Little Seax on my belt. I always carry a small knife unless flying. I use them to open boxes at work. Currently have a Gerber. It is a lock blade and not really legal to carry where I am working overseas but have never been searched by the police in my 18-years overseas. Blade is only 3 1/2 inches but I think it is the forward assist that makes it a no-no. 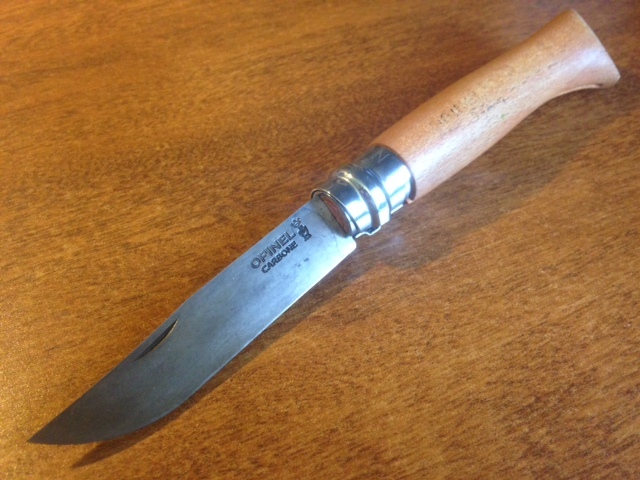 A carbon steel Opinel with 3" blade goes with me anywhere I can take it. I love this design. The handle is slim and has lovely lines. The blade takes a great edge and is easy to sharpen. I sometimes touch it up on the bottom of my coffee mug during the day. The whole package is very light so it's easy to carry all day without problems. The only things missing are a bottle opener and cork screw. Can't have everything I guess. ...I sometimes touch it up on the bottom of my coffee mug during the day. Hey that's my trick too! My wife wonders why the bottoms of some of our mugs are getting this odd grey color. Then I'll strop it on some stray cardboard laying around. Those Opinels do have nice lines! 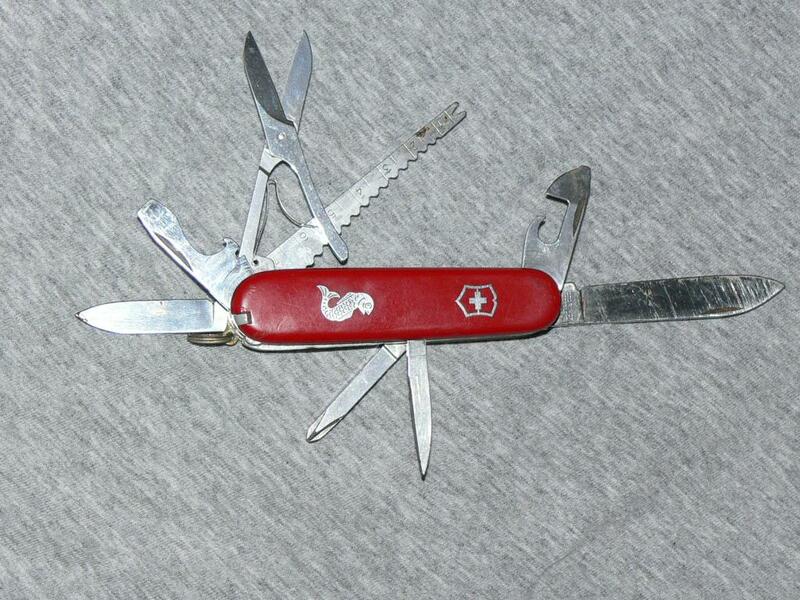 I always (logical exceptions apply) have a small Victorinox MiniChamp in my pocket. It's just a versatile Swiss Army Knife with a diminutive 3,5cm blade and plenty of gadgetry. As far as I know (and I did look it up not two months ago) here in Germany the length and size of a folding knife are generally unrestricted so you could basically even walk around with one of those 22cm Opinel No. 13 knives on you. Fixed single-edged blades are generally allowed in public up to 12.5cm blade length, dagger blades and single edged blades longer than 12.5cm are considered "free weapons" and therefore require a "legitimate reason" for carry (e.g. medieval re-enactment, hunting, keeping traditions), self defense is explicitly listed as "not a legitimate reason". Exceptions with further restrictions would be public rallies and demonstrations, airports and other high-security locations. One-hand folding knives (i.e. 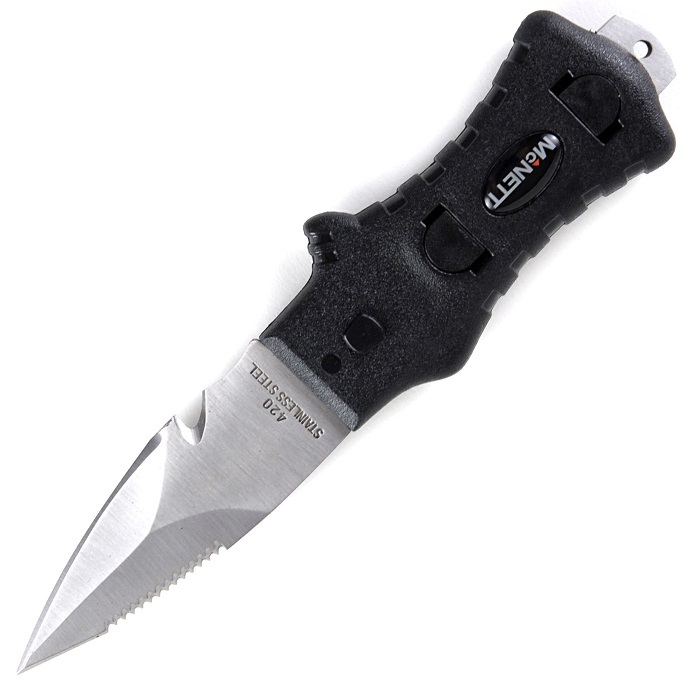 designed to be opened, locked and folded with one hand) have some restrictions regarding blade type and length. 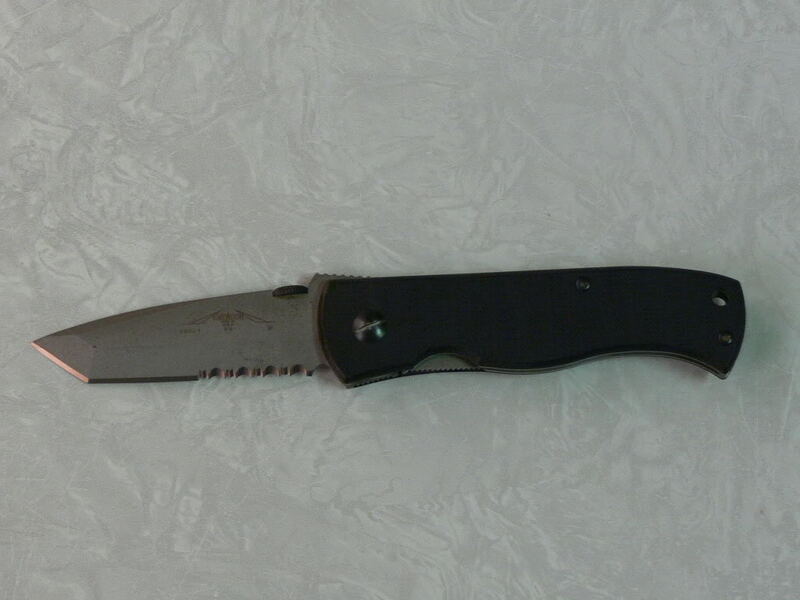 Push daggers, balisongs and many kinds of automatic switchblades are prohibited, even posession is punishable by law.